Home Home-Featured Memorial Day – Remember. Honor. Memorial Day – Remember. Honor. The public gathered at Park Center and West Cedar/St. Boniface cemeteries on Monday. They honored those deceased who served this nation. 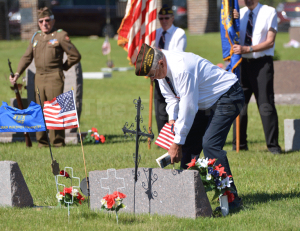 Elgin area residents chose to remember and did not forget, took time to honor the men and women whether they be family or not, who served their country in times of war and peace. First at Park Cemetery, then at West Cedar Valley/St. 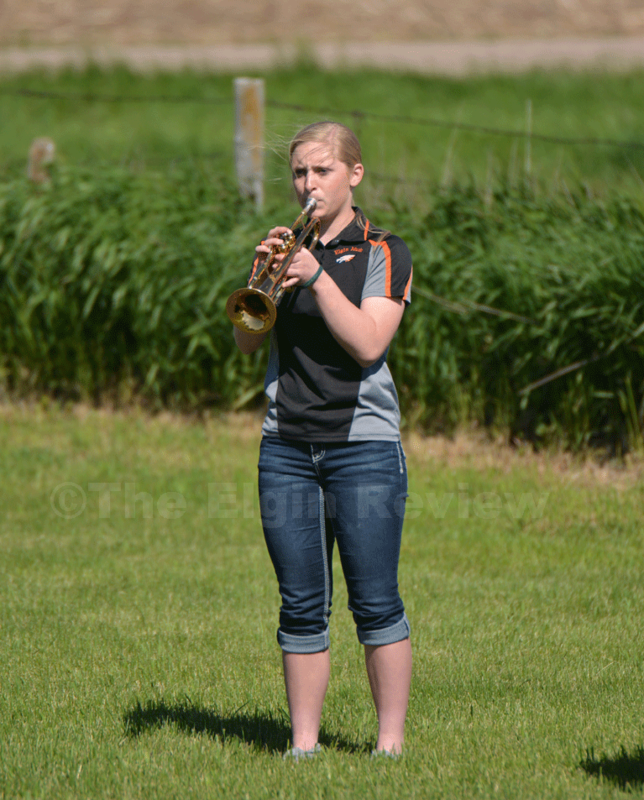 Boniface cemeteries north of Elgin, words were spoken, Elgin High band students played music fitting the occasion and tributes were made by Legion, V.F.W. and auxiliary members as part of a Memorial Day celebration which takes a back seat to no one. At Park, Pastor Janet Davis set the mood for the day. “We gather here today on this Memorial Day 2017 to remember fallen soldiers, sailors, airmen and marines. I believe it would also be appropriate to honor today first responders who lost their lives in service to our country. I am reminded of those law enforcement officers and fire fighters who step up each day on our nation’s soil to protect and defend their communities. They each looked beyond their own self-interest to sacrifice for the betterment of each one of us. “These men and women whom we honor today stepped up on foreign soil and here at home on the battlefield, on secret mission, as they climbed the World Trade Center, as they protected a family in the Middle East, while guarding our nation’s coastlines and skies. They said “yes” when they saw a need and chose a vocation that placed them in harm’s way,” she said. “Whether drafted into service or as a volunteer they did not seek to indulge their personal wants and wishes but looked beyond individualism, consumerism, narcissism and self-enhancement in order to serve us as a nation. In the process, far too many who answered the call to service, made the ultimate sacrifice on our behalf. 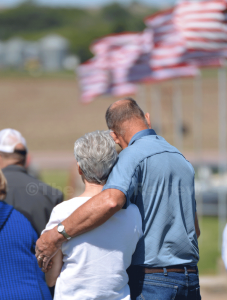 Less than an hour later, the Memorial Day program began at West Cedar Valley/St. Boniface cemeteries. Giving the address was Rev. Michael Davis of the Elgin United Methodist Church. During brief remarks he explained how Memorial Day “represents the truth of the American military’s willingness to give all, and to the American people’s understanding of that sacrifice. Davis said we must always show the true appreciation for these sacrifices on every other day of the year, as we go about our lives, as free Americans. Because those brave Americans gave everything, he said, we live today in gratitude and remembrance. “Finally, let us also remember that even now — across this wide world, in bases near and far, in the friendly lands of our allies, and in the hostile territory of our enemies — American service members are deployed to defend us. They stand ready to follow their orders to any land, to complete the parameters of any mission, to pay any price … including the price of their own lives … to keep us safe. “As we honor all those who came before, who paid that ultimate price, let us too remember those who follow in their footsteps and stand full ready in service to us and the security of our freedom,” he concluded. View all our Memorial Day photos at the photo/zenfolio tab on our homepage. LeRoy Kerkman represented his fellow veterans and planted a flag at the designated grave at Park Center.